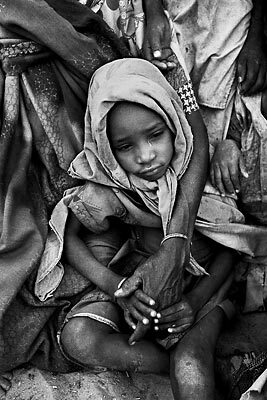 "The Children's War of Nepal"
"Forgotten Refugees of the World"
"The New Europe - The Roma"
"Death in the Desert" A child waits with her mother in Disa, Northern Darfur. Displaced by the recent conflict her village is burnt and her only food source is berries from the trees. It is estimated that there are 800,000 displaced in Darfur who are trapped on the east, west and south by government troops and in the north by the desert wasteland, which will certainly claim the lives of their livestock and weaker members of their family.